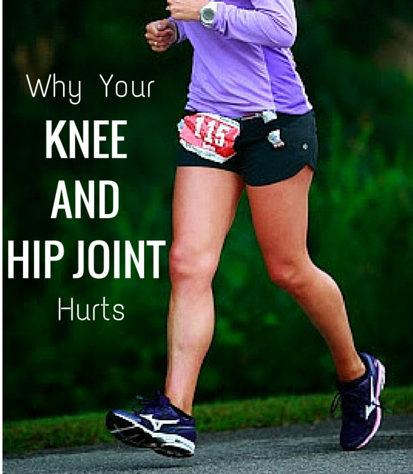 Your heel strike running style is the reason your knee and hip joint hurts. To understand why this happens, it is important to learn how the impact at heel strike interacts with the knee and hip joints. Moreover, to understand how heel strike running is harmful to the body, studies have used computational models that incorporated soft tissue structures, anatomical geometry and impact formulations to quantify the boundary of impact loads at heel strike. We already know that injuries caused by running are created by repetitive trauma impacts and joint overloading, making certain conditions, such as knee osteoarthritis, more likely to occur. However, Kaplan and Heegaard (2000) found a problem with the current research on impact-related injuries in heel strike runners. They noted that most computational models only examined the support-phase of running, not the touchdown phase, which makes it more challenging to understand the interactions of the impact peak and muscular actions in heel strike running. Incorporating the touchdown phase of heel strike running is vital because at heel strike, a measurable impact peak is generated that is not generated in a forefoot strike landing. Because the impact peak at touchdown is strongly related to repetitive stress injury, forefoot runners are often excluded from studies on these injuries for the reason that forefoot running generates no measurable impact peak (Lierberman et al., 2010). Heel strike runners on the other hand, are studied exhaustively to understand the role of the impact peak in degenerative joint progression. The researchers developed a model that incorporated tangential and normal compliances to investigate the ground reaction forces during the impact period of heel strike running. 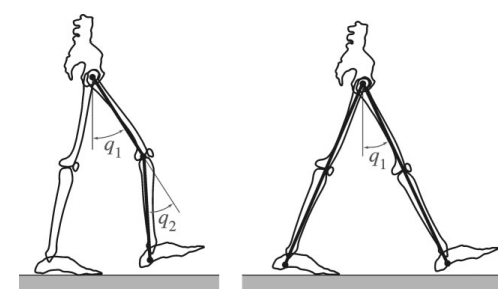 Illustration from the study showing the double leg pendulum model (left) and the second model (right) used to investigate the effects of the impact peak on joint forces. The researchers also used the double leg pendulum model to examine the ground reaction force and a second model was used to examine the ground reaction forces at the front of the foot while the back foot maintained contact. The researchers elegantly demonstrated that at heel strike, impulsive forces were greater than impulsive external forces, indicating a higher collision force between the body and the ground at touchdown. Unsurprisingly, their data was inline with earlier work that showed that ground reaction forces were greater than body weight during heel strike. From this, the researchers inferred that high loading at heel strike coupled with muscular action responses amplified joint reaction forces at the knee and hip. Their data is of considerable relevance because the knees and hips are highly susceptible to degenerative joint disorders in runners who are heel strikers. Lastly, because forefoot running does not generate a measurable impact peak and many aspects of the onset of degenerative joint disorders happen with repetitive exposure to impact peaks, would it not seem to make more sense to be a forefoot runner? 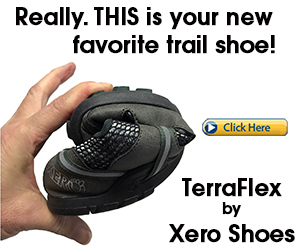 Click here to learn more about how forefoot running prevents injury. Low Back Pain From Running – The cause of low back pain and how to get rid of it. Forefoot vs Heel Strike – An engineer’s perspective on how the two running styles drastically differ. 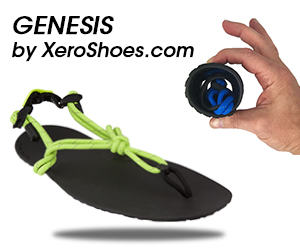 Barefoot Running – A long list of reasons to run without your shoes! 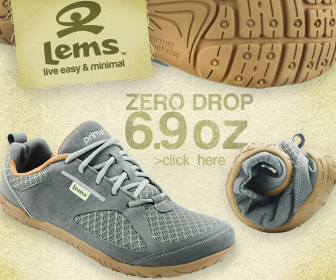 Best Shoes for Forefoot Runners – A forefoot runner’s shoe guide to the most suited minimalist shoes for forefoot running. Be sure to swing on by the Run Forefoot Facebook page, it’s a great place where you can ask questions about foot strike, barefoot running and footwear. I’ll be happy to answer them for ya! Davy, D.T., Audu, M.L., 1987. A dynamic optimization technique for predicting muscle forces in the swing phase of gait. Journal of Biomechanics 20, 187 } 201. Kaplaan ML and Heegaard JH. Energy-conversing impact algorithm for the heel strike-phase of gait. J Biomech, 2000; 33: 771-775. Lieberman, D.E., Venkadesan, M., et al., 2010. Foot strike patterns and collision forces in habitually barefoot versus shod runners. Nature 463 (7280), 531–535. Radin, E.L., Yang, K.H., Riegger, C., Kish, V.L., Connor, J.J., 1991b. Relationship between lower limb dynamics and knee-joint pain. Journal of Orthopaedic Research 9, 398 } 405.